Is N=8 supergravity finite? The first answer that comes to mind is who cares. That's a legitimate approach, since N=8 supergravity is probably not relevant in any way for the real world. More generally speaking, renormalizability or finiteness are no longer considered a holy grail. We now understand that infinities just signal a limited applicability range of a given quantum field theory. I would not expect the ultimate theory of nature to be a finite quantum field theory. More likely, physics at the Planck scale requires a radically new framework (string theory, some may say, but probably that is not radical enough). Having said all this, I hasten to admit that the opening question is an interesting problem of mathematical physics and there are good reasons to study it. One is just curiosity. N=8 supergravity would be the first example of a finite four-dimensional QFT containing gravity. The second reason is that the supposed finiteness would indicate the presence of some powerful hidden symmetry that is able to control the entire perturbative expansion. Last week Lance Dixon argued here at CERN that the answer to the opening question might be positive. This conjecture follows from a complicated technical analysis, details of which are not available to mortal men. Still, Lance did a good job explaining what are the tools he is using. Here is the story so far. The 4D Einstein gravity coupled to generic matter fields is divergent already at one loop. Pure gravity, however, is one-loop finite. This follows from fairly simple symmetry arguments: any possible R^2 counterterm either vanishes by the Einstein equations or is a total derivative. However the divergence strikes back at two loops, as there are R^3 counterterms available. Adding supersymmetry allows to postpone the sentence because the R^3 term haunting the ordinary gravity cannot be supersymmetrized. But there exist supersymmetric R^4 counterterms, so that in supergravity we expect divergences at three loops. The more symmetries we have, the better are our chances. N=8 supergravity has the maximal number of symmetries for a local QFT. But, naively, they are not enough to ensure finiteness of the perturbative expansion. On the other hand, no supergravity amplitude has ever been explicitly shown to be divergent. Hope lives on. The weapons employed by Lance are the KLT relations and the unitarity cuts method. The KLT relations allow to express supergravity tree-level amplitudes in terms of gauge theory tree -level amplitudes. For N=8 supergravity the corresponding gauge theory is N=4 super-Yang-Mills, a finite one. Sounds promising. The unitarity cuts relate tree-level amplitudes to multi-loop ones. These tools allowed Lance and collaborators to argue in an earlier paper that divergences do not appear at 3 loops. More precisely, they concluded that D-dimensional N= 8 supergravity at L loops is finite if D < 2 + 10/L. This would imply that in D=4 dimensions there could be divergences at L = 5 loops. Lance, however, suspects that this bound is too conservative and the true formula is D < 4+ 6/L, just like in N=4 super-Yang-Mills. The hints are provided by unexpected cancellations that have been observed in one- and two-loop supergravity amplitudes. His work concentrates now on evaluating divergent contributions to higher-loop amplitudes in order to see whether the cancellations persist. So, is N=8 supergravity finite? I don't know. Go ask Lance. Unfortunately, the transparencies of the CERN talk are not available. You can look at his most recent paper instead. The KLT relations and unitarity cuts are reviewed in a nice article by Zvi Bern on Living Reviews. See also this this post at Not Even Wrong and another one on Reference Frame. 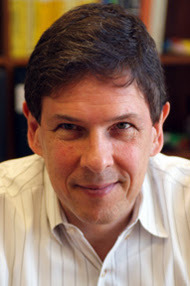 Barton Zwiebach recently wrote the highly acclaimed string theory textbook. 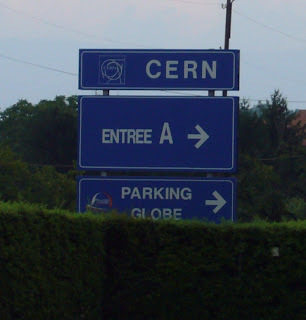 This week at CERN he gave a series lectures entitled String Theory for Pedestrians. A pedestrian is only slightly better than a dummy. Barton is a very good speaker. His priority is to discuss difficult problems using a simple language and intuitive pictures. The downside is that technical difficulties are swept under the carpet. His choice of topics reflects the change of season that seems to be happening in the string theory world. The emphasis was on applications of string theory to real physical systems (hadronic spectra, quark-gluon plasma) or to hypothetical ones but potentially observable in the near future (cosmic strings). Strings as a candidate for a fundamental theory was only briefly discussed towards the end of the last lecture. That's good. The beginning was quite original. The entire first lecture was devoted to the properties of the classical relativistic string (usually, one jumps straight into the quantum theory). It turned out to be a funny physical system, very interesting in its own. The classical theory can be applied to the dynamics of fundamental strings stretched to cosmic sizes. Most of the second and third lecture was devoted to string theory as an effective description of strongly interacting systems. 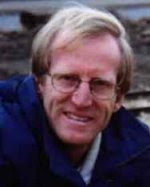 Barton started with a bosonic string and its potential to explain the hadronic spectra and the quark-quark potential. He stressed that it is hard to imagine a physical system other than the quantized relativistic string that could reproduce Regge trajectories (the relation M^2 ~ J between the excited hadron mass and spin). After a brief introduction to AdS/CFT, he moved to the application of string theory to quark-gluon plasma. He spent quite some time discussing the RHIC experiment and the meaning of elliptic flow and viscosity. Then he talked about predictions for the viscosity and jet quenching parameters derived from a string theory dual to supersymmetric QCD. This is presently the hot topic and a front of intensive research. The reason is that high temperatures break supersymmetry, so that there is a chance that supersymmetric versions of QCD (which string theorists know how to handle) yield relevant predictions for the real world experiments. The fact that the quark-gluon plasma has small viscosity, if confirmed, would indicate that QCD at strong coupling has some sort of a gravity dual. That would be something. What is often missing in this discussion is the clear statement: even if some version of string theory will prove to be a good effective description of strongly interacting systems, it does not mean that string theory is the fundamental theory of gravity. The QCD string and the fundamental string are two different things, albeit described by the same framework. He closed with a few bitter remarks about loop quantum gravity. He also expressed his feelings towards the famous string theory critic and fellow blogger. Those string guys seem to hold some kind of grudge ;-) The last question was about honey, seriously. See for yourself. The transperencies and the video recording are available here. Update: For (shamelessly) less enthusiastic remarks about the same event, see this post at Not Even Wrong. Hmmm...vanishing bicycles, laptops, UBS bankcards or Nobel-worth notebooks, that's all well explained within the Standard Model. 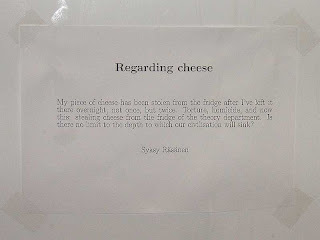 But cheese??? Smells like new physics. Can LHC falsify String Theory? I will make the short story long and I will give a less-than-expert level introduction into the subject. Still, I will speak the quantum field theory language. If you're not familiar with this jargon, or just impatient, you are welcome to jump directly to the bottom line. The most important thing that Papa Weinberg taught us is that the world can be conveniently described by effective quantum field theories. An effective theory is an antonym for the theory of everything. Effective theories have a modest goal to describe those degrees of freedom that are relevant at given energies and in a given experimental setup. Two widespread examples: 1) the Standard Model that describes quarks, leptons and gauge bosons in LEP and Tevatron, and 2) the chiral perturbation theory (ChPT) that describes pions below ~1 GeV. The particles are represented by quantum fields and their interactions by lagrangians. The main organizing principle is symmetry: in an effective lagrangian we include all terms that are consistent with the symmetries we imposed (local SU(3) x SU(2) x U(1) for the Standard Model, non-linerly realized global SU(2) for the ChPT). There is an infinite number of such terms so we classify them according to how much they contribute to scattering amplitudes at energies of interest. The small expansion parameters is the relevant energy over the cut-off scale (the scale at which the effective theory description breaks down). In the Standard Model we start with a renormalizable lagrangian (operators of dimension <= four). We then add higher dimensional operators that could, for example, affect the renormalitable theory predictions for kaon mixing or change the ratio of Z to W mass (no effects of higher-dimensional operators have been found so far, apart from the neutrino masses maybe). A similar procedure applies in the ChPT, but in this case the higher order (four-derivative operators) have actually been measured. In principle, once we know the UV completion of our effective theory we can determine all the coefficients of the effective theory operators. Thus, the effective theory knows about UV. Is it possible to translate general properties of the UV theory into some relations between the coefficients in the effective theory? This question had not been extensively studied before 2006, although it was known that dispersion relations impose constraints on the parameters of the ChPT. Last year the issue was brought to light by Nima Arkani-Hamed et al. in the paper Causality, analyticity and an IR obstruction to UV completion. They argued that there exist constraints which can be understood at a very intuitive level as imposed by causality of the UV theory. Certain higher-dimensional operators, if occuring with a wrong sign, would allow faster-than-light propagation in certain backgrounds. Nima & co. stressed that a discovery of the wrong sign operators in any effective theory would lead to a conclusion that the UV theory is non-causal, unlike quantum field theory or string theory. Jacques Distler et al. applied this idea to a specific theory: the electroweak chiral lagrangian (EWChL). This is a sorf of ChPT for the electroweak gauge bosons. This would be the right framework to describe gauge interactions at the LHC below the scale of the higgs boson mass (if it is much heavier than 100 GeV). EWChL contains (at the four-derivative level) two operators that modify 2->2 scattering amplitudes of the SM gauge bosons. Jacques&friends found constraints on the coefficients of these operators that follow from dispersion relations. Their bounds seem to be stronger than those derived by the Nima's speed-of-light arguments and it would be nice to understand them a more intuitive level. Violation of these bounds would signal violations of the assumptions that enter into the dispersion relations: analiticity and unitarity of the scattering amplitudes. String theory is expected not to violate these properties. Can the LHC falsify string theory then? The answer is a resounding no (of course I can never be 100% sure. I also can't exclude that the LHC will see 1 TeV unicorns, but i wouldn't bet much on any of the two). The most important obstacle is the following. There is a general argument that the EWChL cannot be valid up to very high energies. Reason: EWChL predicts that WW scattering amplitudes become non-unitary around 2 TeV. Therefore the UV completion must become manifest below that scale (the UV theory could well be the Standard Model with a higgs boson). It is highly unlikely that bizarre physics at such a low scale does not manifest itself in any low energy experiments (e.g. in electroweak precision observables). If, on the other hand, the UV theory is a normal well-behaved quantum field theory, it would contribute to the coefficients of the EWChL in a way consistent with the bounds and wipe out any possible contribution of non-standard high energy physics. Bottom line: the LHC is here to investigate the mechanism of electroweak symmetry breaking, not to test string theory. 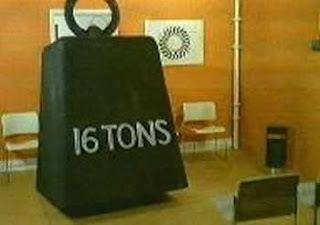 16 tons weight on top of those who claim otherwise. Winter has finally arrived in the region. It should be noted that CERN is not only the greatest particle physics laboratory on Earth but, first of all, the greatest ski club in the Alps. In the coming days the CERN productivity is expected to drop down dramatically, unlike the rate of knee injuries. Officials ensure that LHC schedule is not endangered, for the moment. I need to repeat that again: I didn't expect the Spanish Inquisition. I was linked by the well-known heavy-traffic blog of Peter Woit and apparently I'm having a storming crowd of visitors today. So I owe a word of apology. I feel as if somebody walked into my flat in a morning to see the usual state of affairs. 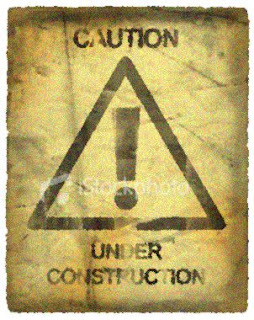 This blog is still in an unstable beta or even gamma stage. I just started and so far I've assumed nobody's going to read what I write. Hope that both the appearance and the quality of my blog will improve with time. Last week CERN was hosting the RTN Winter School on Strings, Supergravity and Gauge Theories coorganized by CERN and the University of Neuchâtel. I already reported about wonderful lectures on LHC phenomenology by Joe Lykken. Another fantastic set of lectures on dynamical supersymmetry breaking was given by Nathan Seiberg from Princeton. 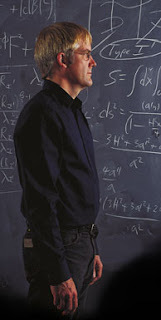 He started with simple examples of spontaneous supersymmetry breaking, stressing the role of R-symmetry. Then he showed how the necessary structures can by generated in a calculable way by strong dynamics. He also discussed his recent breakthrough paper concerning supersymmetry breaking in metastable vacua, which opens the road to simpler realistic models. I'm waiting impatiently for the lecture notes. To kill time, there is the old review by Intriligator and Seiberg. The strictly string theoretical lectures were less illuminating. David Mateos from Santa Barbara talked about the AdS/CFT, and about its relations to quark-gluon plasma in particular. This topic is hot and interesting and David certainly conveyed a lot of his enthusiasm. However his presentation was far from being clear and logical. This kind of lecturing is sometimes referred to as a "google talk": there was nothing you couldn't google out within 5 minutes. The lectures on string cosmology by Cliff Burgess (Mc Master University) can be briefly characterized: chaotic and confusing. Finally, Brian Wecht (MIT) covered non-geometric flux compactifications; anybody who listened to that, please step out ;-). The video recordings of all lectures are available here. 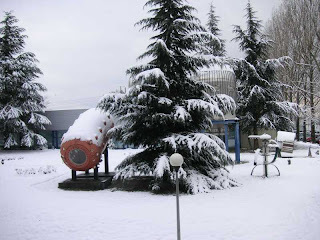 This week CERN hosts the Winter School on Strings, Supergravity and Gauge Theories. One of the lecturers is Joe Lykken from Fermilab. He gave a series of four lectures LHC Phenomenology for String Theorists. The rumour is that the original title was LHC for Dummies and was only changed last minute. I don' t know if for political correctness or just to clarify the level of the target audience ;-). I certainly was the right kind of audience. For some reasons, whenever I hear someone talking about detectors and trackers my eyes start to feel heavy. It was different this time. 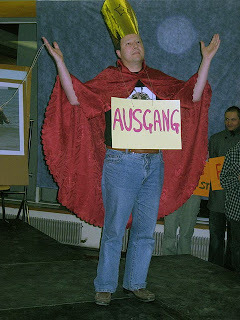 It is well known that Joe is a fantastic lecturer, but I didn't expect the Spanish Inquisition. He explained how hadron colliders work and this was interesting. He discussed top quarks detection at the LHC and this was illuminating. 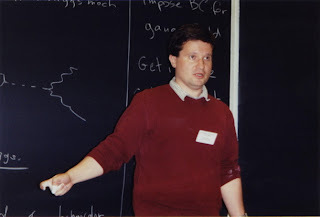 He talked about next-to-next-to-leading order QCD corrections (could you imagine a more mesmerizing subject?) and even that was fun to listen. In the last lecture he talked about discovering new physics at the LHC with the emphasis on supersymmetry. He was surprisingly positive about a possibility of identifying the pattern of soft supersymmetry breaking terms and understanding which string theory model is realized in nature. Well...que sera, sera. The video recording is available here. Though it's less fun, you can also look at the typed notes. Csaba Csaki from Cornell is visiting CERN TH these days. Last week he gave a talk entitled Direct gauge mediation from metastable vacua. The first part of the talk was a very nice review of dynamical supersymmetry breaking, including the recent work by Intriligator, Seiberg and Shih (ISS) concerning supersymmetry breaking in metastable vacua. The second part was a less nice presentation of his model of gauge mediation based on the ISS idea. Dynamical supersymmetry breaking is an attractive idea, which is however hard to implement in realistic models. One of the obstacles is that in simple (non-chiral) theories, like SUSY QCD, the true vacuum is supersymmetric. Recently, ISS noticed that SUSY QCD can have metastable supersymmetry breaking vacua whose lifetime is long enough for practical purposes. This observation raised hopes that realistic models involving dynamical supersymmetry breaking could be greatly simplified. A lot theoretical activity followed (more than 50 citations of ISS in less than one year). The model of Csaba and collaborators is an attempt to get on this train. In gauge mediation we need messengers: the fields coupled directly to the supersymmetry breaking sector and also to the visible sector, via the Standard Model gauge interactions. The messengers communicate supersymmetry breaking to the visible sector and generate an acceptable pattern of soft breaking terms. Typically, this link between the hidden and observable sectors is yet another sector, distinct from the other two. The main idea of Csaba is to make the messengers a part of the susy breaking dynamics. He succeeds, but his fully realistic model is quite involved. It is easy to gauge an SU(5) subgroup (the unified group including the Standard Model) of the ISS-type SU(N) model (SU(6) in the Csaba's paper). Then some of the composite mesons may act as messengers. But one also needs to break the residual R-symmetry of the ISS model to generate the MSSM gaugino masses , so let's add four singlets...and then it goes downhill. We all know it well from our own experience ;-) We start with a fine idea that needs just small amendments to become realistic. After some time we are too deep in the forest to find our way back home. A more interesting model in the similar spirit seems to be that of Murayama and Nomura . It is a less ambitious attempt (the messenger sector is still ad-hoc), but thanks to the ISS idea they get rid of the R-symmetry, that is always a pain in dynamical susy breaking. Anyway, it seems that there is still some room for progress here. CERN reopened today after a looong Christmas and New Year break. Delayed as usual, it enters the year 2007 - the year of the first collision in LHC, hopefully. For theorists there is no obvious reason to be excited yet. The first physics run is scheduled for 2008 and the first indications of new physics are expected not earlier than in summer 2008 (in the most optimistic of all worlds). Nevertheless, there is a feeling in the air that the postmodern epoch particle physics is drawing to a close. For CERN theory it will be the first year without Suzy. No, not without Susy, not yet. I mean Suzy the sectretary (to the left), who has retired after 39 years. The last year closed with a traditional TH Christmas party followed by a traditional TH Christmas play. As usual, it was a good portion of english humor with references to the current particle physics research and lots of obscenity too. Ben Allanach was terrific as Borat/Theorat. Another chapter in the string wars?